I’m a part-time fitness instructor and loving it! 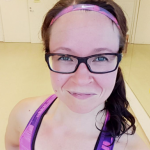 In 2012 I fulfilled my childhood dream to become an instructor, and after graduating from Etnofitness ”Dance Fitness Professional” – course I instructed 2012-2017 in Keho & Mieli -classes in Helsinki. First JamBaila®-classes, and then Fitness Dance- and muscle toning classes. My repertoire includes e.g. Funk dance, Country dance, Soca, Salsa, Ndombolo, Reggaeton, Dancehall reggae, Hip hop, Jazz, Afro, Merengue, Electroswing, Samba and good old aerobics! I love to get people moving, sweating and smiling! Currently I’m a substitute instructor at urheiluhallit.fi. You may find me in several classes (Baila, Body & core, Core & stretching and Fix) and places (Kontula, Vuosaari, Kallio, Mäkelänrinne). I’m also available for freelance dance fitness instructing. Contact me to get a free video sample or more info!